Join us in making a difference in the world! We are here to connect you to meaningful, impactful volunteer opportunities, such as staffing our in-house food pantry, delivering fresh challahs to members recovering from illness, taking elderly members to visit the graves of loved ones, cooking and serving food to the homeless, leading shiva services, and so much more. Temple Israel continues to collect pop tabs for the Ronald McDonald House of Detroit on a regular basis. Please save your pop tabs and bring them to the drop box at the Tyner entrance. The Ronald McDonald House supports the families of sick children. We’re always looking for warm and friendly volunteers to help serve lunch to our seniors on Shabbat. This is a fun, easy and meaningful volunteer experience. Services begin at 10:30 am, followed by lunch. Senior Shabbat is sponsored by the Susan & Hanley Yorke Fund. Limited transportation sponsored by the Iwrey Family Special Needs Fund. For questions or more information, please email us or call 248-661-5700. We match volunteers with seniors living in senior facilities around the community to build friendships between them and to bring some extra love into to their lives. Volunteers visit regularly, and at least once a month. Would you like to be a volunteer or know someone that you'd like our team to visit? Please contact the Temple office 248-661-5700 for information. This group of committed Young Adults from our congregation are making strides to repair the world through social action. Every year, we host a signature program called Causes & Kegs - a “shark-tank” style event held in Detroit. We invite three non-profit organizations that are making a positive impact in Detroit to share their mission with us. Our participating Cause We Care team then votes to give proceeds from the admissions price to one of these deserving organizations. Cause We Care also hosts three other social justice and social action programs during the year. These events are geared towards young adults and young families, to encourage volunteering and outreach that benefits local organizations. To get involved, please contact the Temple office 248-661-5700 for information. One of our most critical volunteer opportunities is helping to feed the hungry in our immediate community. You can make an impact. 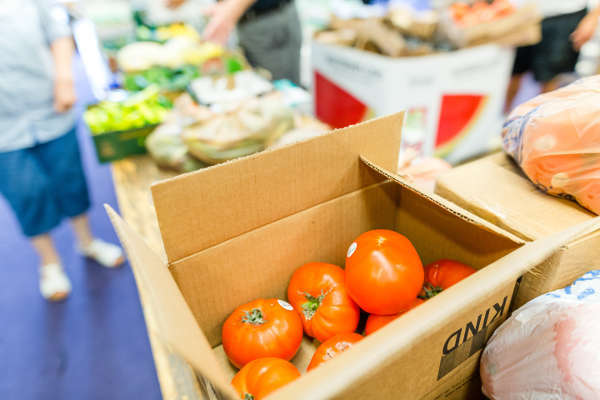 Our Food Pantry volunteers interact with those who come for food, sort and organize the food items, and ensure that everything makes it into the customer’s vehicle for transport home. We do this on the first and third Tuesday of each month from 3-5 pm. For more information and to get involved, please call 248-661-5700. The mission of the Baldwin Center is to "feed, clothe, educate and empower the men, women and children of the Pontiac community." Join us as we volunteer our time to help serve lunch to those in need. 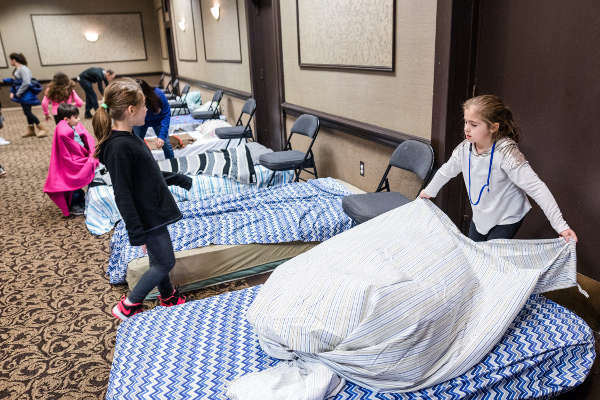 Every December during the holiday season, Temple Israel serves as temporary housing for the homeless. We host men, women and children from the South Oakland Shelter. This effort is staffed by volunteers. As it grows, we welcome more volunteers for a variety of jobs. Come join us and help make the holiday season a little brighter for someone in need. Temple Israel's SOS project is supported by the Lynn & Harvey Rubin Social Action Fund, the Lauren & Phillip Fisher Family and the Steven Gotlib Memorial Fund. Temple Israel in conjunction with its Robert Sosnick Family Life Center, funded by the Ira Kaufman Chapel, presents the 22nd Annual Kever Avot. This very special program provides an opportunity for older adults in the community to visit the gravesides of their loved ones. This program serves the residents of assisted living facilities and apartments. Temple Israel is looking for temple members to volunteer and help with this Mitzvah of a Lifetime! As a volunteer, you will accompany an older adult on a one-to-one basis for the morning. Senior signup, please contact Kate or call 248-661-5700. Know Hebrew? Can sing? The Minyan Corp is comprised of both our minyan leaders who lead daily morning services at Temple Israel and those who go into houses of mourning to lead evening services during the period of shiva. 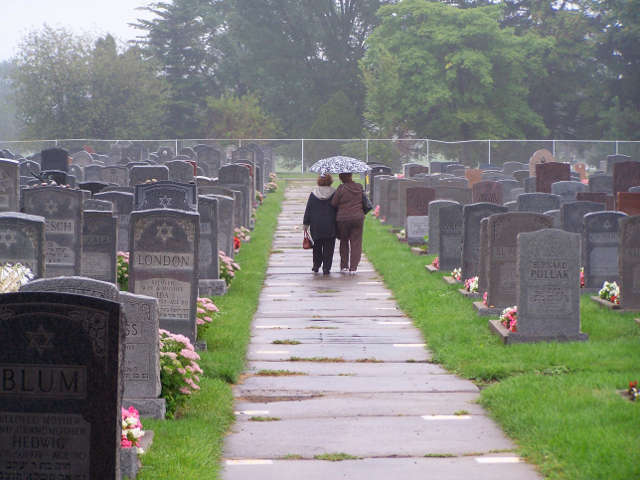 This is such a special volunteer effort, for the volunteer as you provide the opportunity for mourners to say the Kaddish for their loved and help guide them in the process of bereavement. Come pay it forward: Temple Israel invites you to join us as we participate in the community-wide Mitzvah Day, December 25th. This is a great volunteer opportunity for b’nai mitzvah students and their families. For questions or more information, email us or call at 248-661-5700. Our Shabbat B'Yachad (Shabbat Together) team delivers Shabbat dinners to your home when a new baby arrives. Volunteers are needed to help deliver these special meals. Shabbat B’Yachad is funded by the Josephine & Harry Colton Shabbat B'Yachad Fund. Flying solo on Shabbat? New member? Visitor? Or simply solo? This is a group that sits together at Kabbalat Shabbat services on Friday nights. Discover the real joy in Shabbat fellowship. Come sit, sing and pray, and then join us for the oneg after services. Just give us a call and we’ll meet you at the door! For more information, please contact Mary Jane Larson at 734-812-8170. Be a friendly face in the crowd! The Usher Corp welcomes members to services, passing out prayer books and programs with a friendly smile and a Shabbat Shalom. We deliver food to the homebound with Yad Ezra. This is a minimal time commitment. Temple Israel partners with Dixon Educational Learning Academy in Detroit. Temple volunteers help read with Kindergarten students; days and times are flexibile. If you’re a bookworm, you’ll love to volunteer at book fair with set up, assisting shoppers and special programs during our two annual book fairs. The Chanukah Book Fair is the first week in December, while the Passover Book Fair is one week prior to Passover. For more information contact our librarian, Lauren Marcus Johnson 248-661-5700.